Have a healthy home with a De'Longhi's Air Purifier featuring a unique Air Quality Sensor technology. This intuitive system’s sensors continuously monitor the air quality providing you with the visual assurance to "see the clean air" through colour changing LEDs. Complete with A very elegant control panel, easy to use with a few buttons to choose from for all your needs. With 5 layers of filtration, trapping allergens, asthma triggers, odours, chemicals and believe it or not even bacteria and viruses. 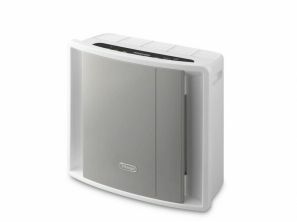 With ultra-low noise levels and easy to use display features, a Delonghi Air Purifier is perfect for any room in the house. Suitable for rooms up to150 sq. ft.